Both Elsa and I train our puppies from the moment they move in with us. Since the puppy is like a clean slate, we want to be there from the beginning and teach her the right things. Puppies are resourceful and learn all the time – no matter if we teach them what they should learn or not, and if we do, later we don’t have to teach the puppy to stop doing a lot of things that she has taught herself. 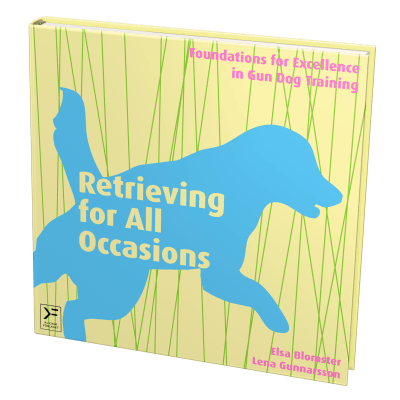 Therefore we train our puppy according to the motto: TRAIN, PREVENT, INTERRUPT – you can read more about this in our book Retrieving for All Occasions. In the beginning we, of course, mostly teach the puppy about things that evolves everyday life and the most important thing is that the little puppy feels safe and loved in our company. 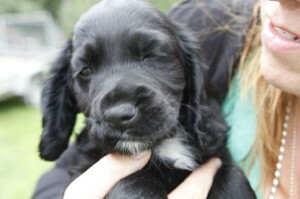 We also want to give her the opportunity to discover and understand our world – in which the puppy now will live with us. We do all those things with our puppy, that we guess, most people do with theirs – we introduce the puppy to different environments, we train steadiness all the time, and we let the puppy met different kind dogs and people, we teach the puppy to walk on a leash, to sit before going out through the gate, and so on. As we want to train and compete with our dogs, we want the dog to have a good foundation so that she is ready for all the challenges that may come. Thus, we immediately begin to build a good foundation for the future and that is why play is so important. We use different games to teach the puppy a lot of things that later will be useful in the hunt, the obedience training, and what ever other sport we wish to do with our dogs. 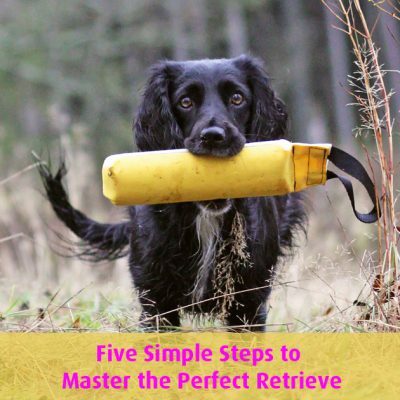 (In our blog post Teach the puppy taking, holding and releasing you can read about a very good game to play with your dog.) But before we can even start to play that game, or any other game for that matter, we teach the dog to play with us. Some dogs know how to play immediately. They chase the toy that we drag around on the ground, they take the toy with a lot of power, they play tug-of-war enthusiastically, and run after a ball – and they come back with it. 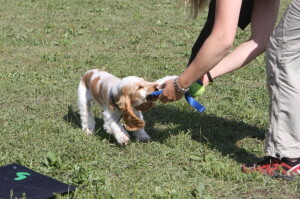 But most dogs need to be taught to do certain things – for example to hold the toy or come back with the toy. When the dog plays enthusiastically and happily we might need to teach the dog a couple of rules of for the game. Sooner or later, the puppy has to learn to let go of the toy on cue and, after a while, we also want the dog only to take the toy on cue and not just to throw herself at it as soon as she sees it (self-control). 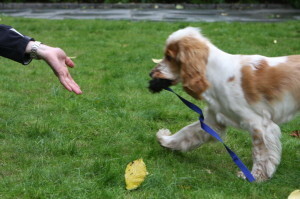 When we play with our puppy we train basic skills such as taking, holding, and releasing a toy as well as a very important behaviour in retrieving: Delivery to hand. We teach the puppy delivery to hand trough playing – we encourage the puppy when she comes to us with an object in her mouth and give her a lot of different rewards. 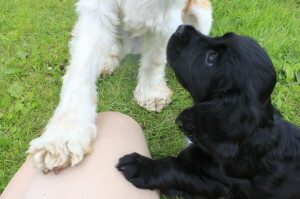 We also start to teach our dog the hand target very early. We begin with a simple exercise. 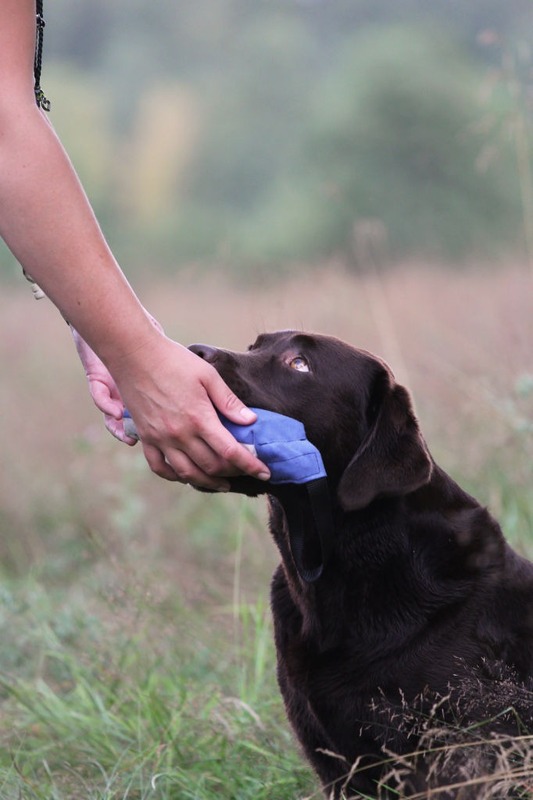 We just hold out our hand and the puppy will, of course, sniff our hand and then we click and give at treat – and soon the dog is very good at the hand target. Other simple basic exercises that we like to do with our puppy is to click and reward the dog when she walks on our left side and looks up at us. Furthermore we continue to teach the dog self-control and steadiness through reversed luring (you could read more about that here). 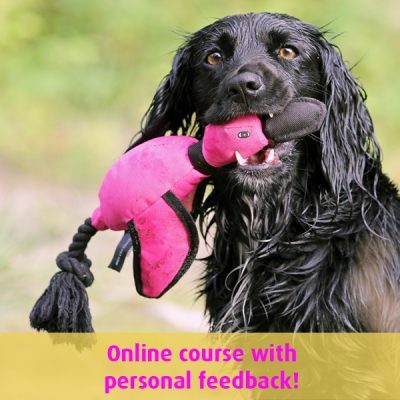 Sometimes some people seem to get a little worried because we teach our puppies certain behaviours that they later on has to know in the hunt or obedience training – is that really okay? We do understand their concern, because we also think that it is very important for puppies to have a good balance in everything they do, so that they don’t get stressed and hyperactive. It is very important to always bear in mind never to push a dog to hard, or (consciously) correct her so that she feels uncomfortable. 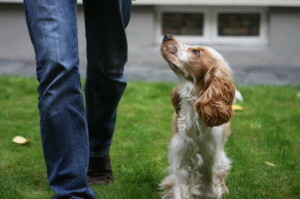 There are many training methods, when the handler expects the dog to do what she has been taught, and if not, the dog will be punished physically. 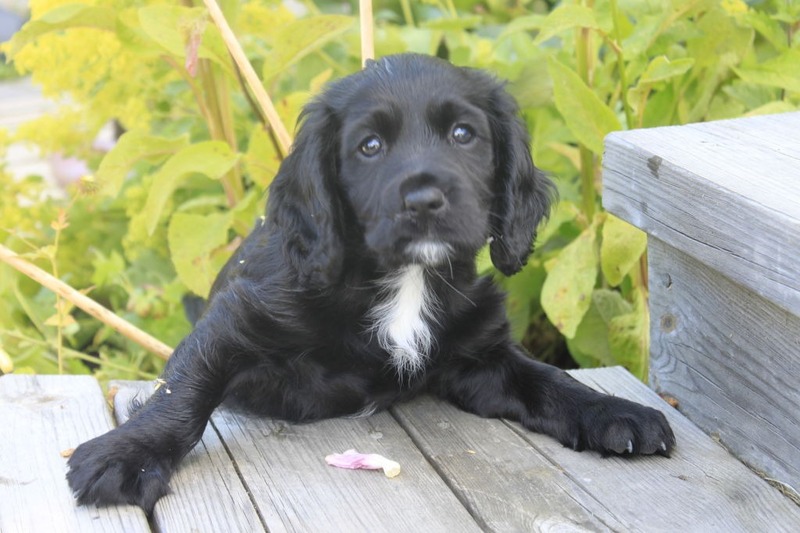 Most people who use these training methods probably don’t want to punish a little puppy like that, and maybe they therefore wait awhile before they start to train their puppy. The might think that the dog should be old enough to “cope” with a proper correction. But as we choose to use clicker training, we never punish our dogs physically. When we train our dogs we have the responsibility to ensure that the dog is able to do what we ask her to do. If the dog can’t do something that we ask her to do, we need to improve something in our training. We never blame the dog. 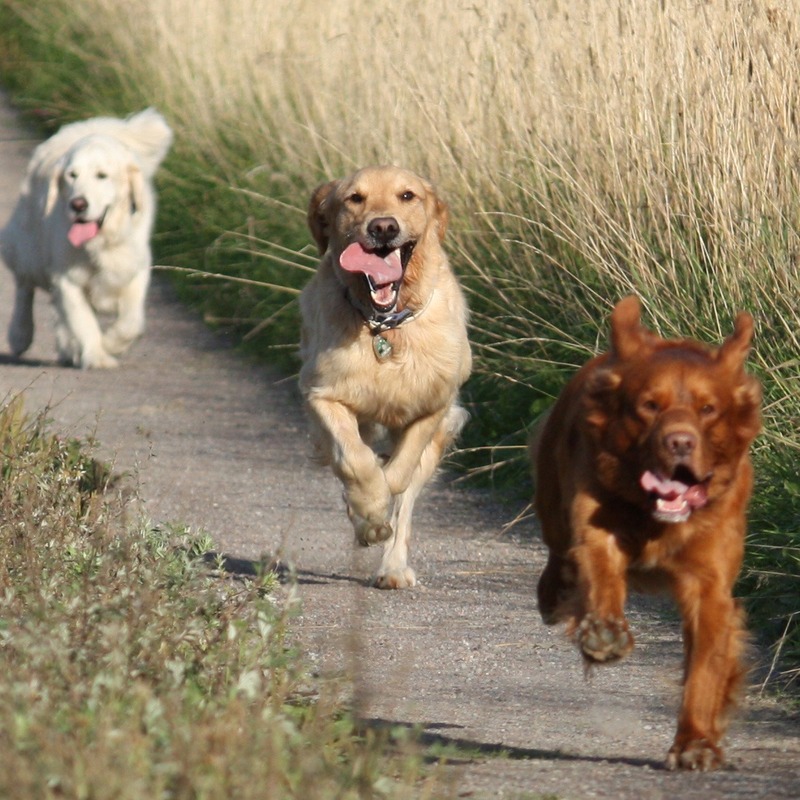 Therefore we put very little pressure on our dogs – so we can train them even when they are very small puppies. In summary: We train only our puppies in a playful way and we do exercises that for instance will teach them taking and holding an object, delivery to hand, steadiness and heelwork. In addition to this we also train our dog to relax and get used to different environments and situations. Study the puppy you have in front of you. What does she need more of? Less of? Is she mature? Immature? Adjust the training so that it suits the dog. Don’t forget that the dog needs a certain balance between rest and activity, and exercises that are active and calm. Only train a very short time. Sometimes one minute is enough or maybe five clicks, and then the puppy needs a break. You should always have good rewards – treats and toys.